Standiford Family: Do you know what this is? Today started out just like any other Saturday. I got to sleep in a little. The kids were up watching tv or playing the computer. Mickey made a run to Lowes. Then he took Meg to a softball practice. (Yes, already, and yes, it was indoors.) Megan also needed to finish up a little work on her science experiment. Mickey helped her with it. I was still lounging in bed (one of the perks of having a great husband) when Meg comes to the door asking where the air freshener is. I asked why. Oh, the popcorn burned. Right after that I could smell it. I got up and I could see the smoke filling the entire house. (This is really good when your house is on the market.) I went to the kitchen to see what the damage was. Just really smokey. The windows were already open. I lit a candle hoping that would help with the smell. I got a fan to blow the smoke out. After most of the smoke was gone I got out some Febreze and sprayed that stuff everywhere. It's now about 10 hours later and the smell is still here, although I'm getting used to it. How do you get the burn smell out of the house? We have a ton of realtors coming through on Tuesday and another showing on Wednesday. When I burnt a beanbag to smithereens, it sort of helped to microwave a bowl of water with some lemon juice in it. And it helped to plug your nose for a few months, too. THAT is burnt popcorn? 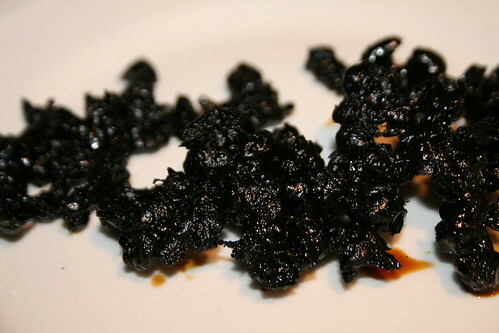 I've never seen popcorn quite so burnt. What was the experiment? The experiment was to store popcorn seeds in different temperatures and see which batch pops the fastest and the most kernels. The popcorn was cooked on the stove and the adult in charge didn't remember from last time that you use medium heat and not high. After he noticed it was burning he removed it from the burner but the pan was so hot still it kept on burning and bubbling up. Kind of wish I could have seen it happening. Perhaps a charcoal odor absorber? When I was an apartment manager we would spray fake vanilla extract on really smelly items, let it sit and then wash it. Somehow, the chemicals in the extract actually neutralized the odor, but I don't know about popcorn smell. It worked for rotten things in fridges, though. Also, turn off the heater, and leave (or wear about three coats! It's cold out! ), and totally air the place out by opening all windows for a few hours. Good luck!